UPDATE: There are now papers being added to the official PCMDI list. It seems as though anyone can add papers to that list so there are lots of “Submitted” papers. The list below is of papers that have been published. Ahlström et al (2012) “Robustness and uncertainty in terrestrial ecosystem carbon response to CMIP5 climate change projections” Environ. Res. Lett., 7, 044008. Arora et al. (2011) “Carbon emission limits required to satisfy future representative concentration pathways of greenhouse gases” Geophys. Res. Lett., 38, L05805. Biasutti (2013) “Forced Sahel rainfall trends in the CMIP5 archive” J. Geophys. Res., DOI: 10.1002/jgrd.50206, in press. Bellouin et al. (2011) “Aerosol forcing in the Climate Model Intercomparison Project (CMIP5) simulations by HadGEM2-ES and the role of ammonium nitrate” J. Geophys. Res., 116, D20206. Branstator and Teng (2012) “Potential Impact of Initialization on Decadal Predictions as Assessed for CMIP5” Geophys. Res. Lett., doi:10.1029/2012GL051974, in press. Cai et al. (2012) “More extreme swings of the South Pacific convergence zone due to greenhouse warming” Nature, 488, 365–369. Chang et al (2012) “CMIP5 multi-model ensemble projection of storm track change under global warming” J. Geophys. Res., doi:10.1029/2012JD018578, in press. Christensen and Boberg (2012) “Temperature dependent climate projection deficiencies in CMIP5 models” Geophys. Res. Lett., 39, doi:10.1029/2012GL053650, in press. Dai et al. (2012) “Increasing drought under global warming in observations and models” Nature Clim. Change, doi:10.1038/nclimate1633. Dobrynin et al. (2012) “Evolution of the global wind wave climate in CMIP5 experiments” Geophys. Res. Lett., doi:10.1029/2012GL052843, in press. Driscoll et al. (2012) “Coupled Model Intercomparison Project 5 (CMIP5) simulations of climate following volcanic eruptions” J. Geophys. Res., doi:10.1029/2012JD017607, in press. Dunn-Sigouin and Son (2013) “Northern Hemisphere blocking frequency and duration in the CMIP5 models” J. Geophys. Res., DOI: 10.1002/jgrd.50143, in press. Gillett and Fyfe (2013) “Annular mode changes in the CMIP5 simulations” Geophys. Res. Lett., DOI: 10.1002/grl.50249, in press. Good et al. (2011) “A step-response simple climate model to reconstruct and interpret AOGCM projections” Geophys. Res. Lett., 38, L01703. Guilyardi et al. (2012) “A first look at ENSO in CMIP5” CLIVAR Exchanges, 17, 29-32. Haywood et al. (2011) “The roles of aerosol, water vapor and cloud in future global dimming/brightening” J. Geophys. Res., 116, D20203. Heuzé et al. (2013) “Southern Ocean bottom water characteristics in CMIP5 models” Geophys. Res. Lett., DOI: 10.1002/grl.50287. Jiang et al. (2012) “Evaluation of Cloud and Water Vapor Simulations in CMIP5 Climate Models Using NASA “A-Train” Satellite Observations” J. Geophys. Res., doi:10.1029/2011JD017237. GFDL summary. Jones et al. (2011) “The HadGEM2-ES implementation of CMIP5 centennial simulations” Geosci. Model Dev., 4, 543–570. Kamae and Watanabe (2012) “On the robustness of tropospheric adjustment in CMIP5 models” Geophys. Res. Lett., doi:10.1029/2012GL054275, in press. Kawase et al. (2011) “Future changes in tropospheric ozone under Representative Concentration Pathways (RCPs)” Geophys. Res. Lett., 38, L05801. Kelley et al. (2012) “Mediterranean precipitation climatology, seasonal cycle, and trend as simulated by CMIP5” Geophys. Res. Lett., doi:10.1029/2012GL053416, in press. Kim et al. (2012) “Evaluation of short-term climate change prediction in multi-model CMIP5 decadal hindcasts” Geophys. Res. Lett., doi:10.1029/2012GL051644. Knutti and Sedlácek (2012) “Robustness and uncertainties in the new CMIP5 climate model projections” Nature Climate Change, doi:10.1038/nclimate1716, in press. Knutti et al. (2013) “Climate model genealogy: Generation CMIP5 and how we got there” Geophys. Res. Lett., 40, doi:10.1002/grl.50256. Kug et al. (2012) “Improved simulation of two types of El Niño in CMIP5 models” Environ. Res. Lett., 7, 034002, doi:10.1088/1748-9326/7/3/034002. Liu et al. (2012) “Co-variation of temperature and precipitation in CMIP5 models and satellite observations” Geophys. Res. Lett., doi:10.1029/2012GL052093, in press. Massonnet et al. (2012) “Constraining projections of summer Arctic sea ice” The Cryosphere Discuss., 6, 2931-2959. Meijers et al. (2012) “Representation of the Antarctic Circumpolar Current in the CMIP5 climate models and future changes under warming scenarios” J. Geophys. Res., doi:10.1029/2012JC008412, in press. Mizuta (2012) “Intensification of extratropical cyclones associated with the polar jet change in the CMIP5 global warming projections” Geophys. Res. Lett., doi:10.1029/2012GL053032, in press. Monerie et al. (2012) “Expected future changes in the African monsoon between 2030 and 2070 using some CMIP3 and CMIP5 models under a medium-low RCP scenario” J. Geophys. Res., doi:10.1029/2012JD017510, in press. Nam et al. (2012) “The ‘too few, too bright’ tropical low-cloud problem in CMIP5 models” Geophys. Res. Lett., doi:10.1029/2012GL053421, in press. Oleson (2012) “Contrasts between Urban and Rural Climate in CCSM4 CMIP5 Climate Change Scenarios” J. Climate, 25, 1390–1412. Osprey et al. (2013) “Stratospheric Variability in Twentieth-Century CMIP5 Simulations of the Met Office Climate Model: High Top versus Low Top” J. Climate, 26, 1595–1606. Reichler et al. (2012) “A stratospheric connection to Atlantic climate variability” Nature Geoscience, doi:10.1038/ngeo1586. Rotstayn et al. (2012) “Aerosol- and greenhouse gas-induced changes in summer rainfall and circulation in the Australasian region: a study using single-forcing climate simulations” Atmos. Chem. Phys., 12, 6377-6404. Sabeerali et al. (2013) “Simulation of boreal summer intraseasonal oscillations in the latest CMIP5 coupled GCMs” J. Geophys. Res., doi: : 10.1002/jgrd.50403, in press. Sarojini et al. (2012) “Fingerprints of changes in annual and seasonal precipitation from CMIP5 models over land and ocean” Geophys. Res. Lett., doi:10.1029/2012GL053373, in press. Sillmann et al. (2013) “Climate extremes indices in the CMIP5 multi-model ensemble. Part 1: Model evaluation in the present climate” J. Geophys. Res., doi: 10.1002/jgrd.50203, in press. Stevenson et al. (2012) “Will There Be a Significant Change to El Niño in the Twenty-First Century?” J. Climate, 25, 2129–2145. Stroeve et al. (2012) “Trends in Arctic sea ice extent from CMIP5, CMIP3 and observations” Geophys. Res. Lett., 39, L16502, doi:10.1029/2012GL052676. Su et al. (2012) “Diagnosis of regime-dependent cloud simulation errors in CMIP5 models using “A-Train” satellite observations and reanalysis data” J. Geophys. Res., doi:10.1029/2012JD018575, in press. Taylor et al. (2011) “An Overview of CMIP5 and the Experiment Design” Bull. Am. Meteorol. Soc. Tian et al. (2013) “Evaluating CMIP5 Models using AIRS Tropospheric Air Temperature and Specific Humidity Climatology” J. Geophys. Res., 118, in press. Todd-Brown et al. (2012) “Causes of variation in soil carbon predictions from CMIP5 Earth system models and comparison with observations, Biogeosciences Discuss., 9, 14437-14473. Turner et al. (2013) “An Initial Assessment of Antarctic Sea Ice Extent in the CMIP5 Models” J. Climate, 26, 1473–1484. Villarini and Vecchi (2012) “Twenty-first-century projections of North Atlantic tropical storms from CMIP5 models” Nature Climate Change, doi:10.1038/nclimate1530. Villarini and Vecchi (2013) “Projected Increases in North Atlantic Tropical Cyclone Intensity from CMIP5 Models” J. Climate, 26, 3231–3240. Wang and Overland (2012) “A sea ice free summer Arctic within 30 years-an update from CMIP5 models” Geophys. Res. Lett., doi:10.1029/2012GL052868, in press. Watanabe et al. (2011) “MIROC-ESM 2010: model description and basic results of CMIP5-20c3m experiments” Geosci. Model Dev., 4, 845-872. Yang and Christensen (2012) “Arctic sea ice reduction and European cold winters in CMIP5 climate change experiments” Geophys. Res. Lett., doi:10.1029/2012GL053338, in press. Yeh et al. (2012) “Changes in the Tropical Pacific SST Trend from CMIP3 to CMIP5 and Its Implication of ENSO” J. Climate, 25, 7764–7771. Yin (2012) “Century to multi-century sea level rise projections from CMIP5 models” Geophys. Res. Lett., doi:10.1029/2012GL052947, in press. Ying and Chong-Hai (2012) “Preliminary Assessment of Simulations of Climate Changes over China by CMIP5 Multi-Models” Atmospheric and Oceanic Science Letters, in press. Zhang and Jin (2012) “Improvements in the CMIP5 simulations of ENSO-SSTA meridional width” Geophys. Res. Lett., doi:10.1029/2012GL053588, in press. Zunz et al. (2012) “How does internal variability influence the ability of CMIP5 models to reproduce the recent trend in Southern Ocean sea ice extent?” The Cryosphere Discuss., 6, 3539-3573. Dong et al. (2012) The Atlas of Climate Change — Based on SEAP-CMIP5. Springer. 200pp. Here are some links to useful climate data/tools. There’re my favourite places to get simple data. If anyone uses anything different, please leave let me know! KMNI’s Climate Explorer – excellent tool to get loads of data and basic plots. I’ve always found the inface friendly too. NASA’s GISS Surface Temperature Analysis (GISTEMP) – raw station data and nice plotting tool. UEA’s Climatic Research Unit have lots of data but no plotting tools. Daily Earth Temperatures from Satellites – if you want satellite derived temperatures from various levels, this is the place to go. NOAA’s National Climatic Data Centre – looks like there’s lots there but I’ve never really looked through it. The University of Wyoming’s weather balloon data – probably a bit niche for this list but this is an amazing archive of balloon data from all over the world! Surely you need to check just how strong the Antarctic inversion is today? No? I wrote a post last winter about how the snow doesn’t mean that climate change is over. October 2010 temperature anomalies relative to the period 1951-1980 from the NASA GISS webpage. Whilst I would describe myself as a scientific skeptic, in that I will try to investigate claims before coming to a judgement, I would not say I was a “climate change skeptic”. This term is often used to label those that are irrationally dismissive of the scientific evidence (or worse). Several commentators on climate issues, notably George Monbiot of the Guardian, have now started referring to many within this group as “climate change deniers” as it appears that any amount of evidence counter to their stance will alter their belief in that position. One prominent blogger, though, found the use of the denial tag unhelpful and has set himself the challenge, as a layperson, “to make sense of the global warming and climate change debates” via a new blog. Now, though, we have an opportunity to test the scientific integrity of one of these skeptics. 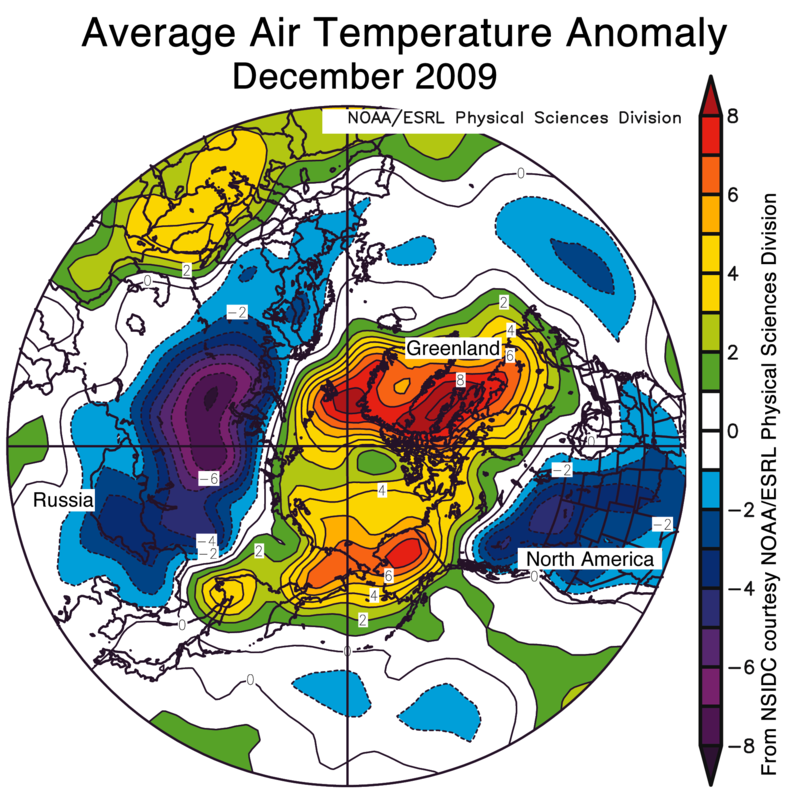 Anthony Watts, an American weather presenter, blogger and self proclaimed climate change skeptic, was instrumental in setting up a web campaign to survey the United States climatological surface station records – SurfaceStations.org. This is a laudable scientific aim, regardless of the fact that it was done in the belief that it would show that the surface temperature recording method was flawed and that the warming trend observed in the US was an artefact of the local micro-conditions. The analysis on the website consists of quite a lot of not-very-scientific comments about photographs on how poorly sited some of these stations are. Watts has also published a report with some of the photographs alongside their temperature records. However, Matthew Menne (a scientist at the American National Climatic Data Center) and co-authors have published a peer reviewed, systematic analysis of the US surface station temperature records. The results show that the poorly located stations, as determined by SurfaceStations.org, actually show a negative bias relative to the well located sites. This means that the poorly located sites introduce an artificial cooling in the temperature record, not a warming as Watts predicted. Clearly, the uncovering of such a bias in the surface station network in the US means that the infrastructure requires tighter regulation as it is not, at certain locations, doing its job properly. In this situation, I suspect that a true skeptic would be proud that their effort had highlighted a real issue and contributed to the scientific understanding. However, as SurfaceStations.org approached their investigation with the hypothesis that the network would introduce artificial warming, how will they react? The story is about a claim in the 2007 IPCC report that the Himalayan glaciers would melt by 2035. It turns out that the evidence for this claim was from a speculative comment made by a not-very-prominent glaciologist in New Scientist in 1999. The Times and The Express have gone to town with this story. So, what does it really mean? Each group produced a separate report in 2007. They were each about 1000 pages long. This was the fourth IPPC report round, the others were in 1990, 1995 and 2001. WGI reviews and synthesises all the work on the physics and chemistry of the Earth system and tries to make projections of how things like temperature, rainfall and atmospheric circulation will change in the future. I refer to this report a lot in my work as a meteorologist/climatologist. I know a little about Working Group II – it is written by hydrologists, glaciologists, economists, social scientists and medical scientists – but I have very little idea about what goes on in WGIII. I also confess that I’ve never looked at the WGIII report. WGs II and III rely on a certain degree of speculation; it is their business to ask what the world would be like if certain things happen based on the projections from WGI. Was the Himalayan meltdown a “central claim” in the IPPC report? The 2035 date relating to the Himalayas appears in one sentence in Chapter 10 of the Working Group II report. So this is one sentence in nearly 3000 pages. As far as I can see (please correct me if I’m wrong) the 2035 claim was not repeated in the WGII Summary for Policymakers or the overall Synthesis Report. This was not a central claim. Given that WGII is speculative by nature then Glaciergate appears to be a reviewing error rather than an attempt to distort the science. Why the claim was given an implied “very likely” (90% certain) tag is worrying but then this is the first questioning of anything in the report that I can remember since it was published in 2007 – that says a lot for the skill and thoroughness of the report reviewers. Most importantly, though, the WGII glacier claim changes absolutely nothing about the fundamental science behind climate change that appears in WGI. This is like saying you wont trust anything in the economics section of The Times because they once printed a football result wrong. The WGI science is all robust and, if anything, quite conservative in its claims and projections. Today’s Express also makes this statement as if it undermines the whole of the IPCC. If anything, it just shows that the reporter has very little idea what the IPCC actually does. Pachauri has worked in several different scientific disciplines and has headed a large organisation before. In my mind, that more than qualifies him to head the IPCC. Anyway, if you’re looking for people with in depth knowledge of specific fields, then there are the WG Chairs. For example, WGI was chaired by Susan Solomon, who stands a pretty good chance of being awarded a Nobel prize for her work in the 1980s on the ozone “hole”. Beneath the WG Chairs, each chapter has at least 1 co-ordinating author and 1 lead author. Beneath them, each chapter also has many contributing authors, all experts in their field. This attack on Pachauri doesn’t hold up very well. This claim was made in the Times yesterday, with the other cited cracks being the CRU email theft and something about sea level rise estimates. This claim seems to assume that “consensus” means that no new work is going on in the climate sciences or at least demonstrates a complete ignorance of how science works. Things will change in the science, which is exactly why the plans for the next IPCC report (due in 2014) are already well under way! These are exciting (and, if I’m honest, a little depressing) times for climate science so its disappointing that many people outside the research community don’t want to know about it. NOTE: This post is from January 2010. I put a temperature anomaly plot from October 2010 here and I’ll do one for November 2010 as soon as the data is available. 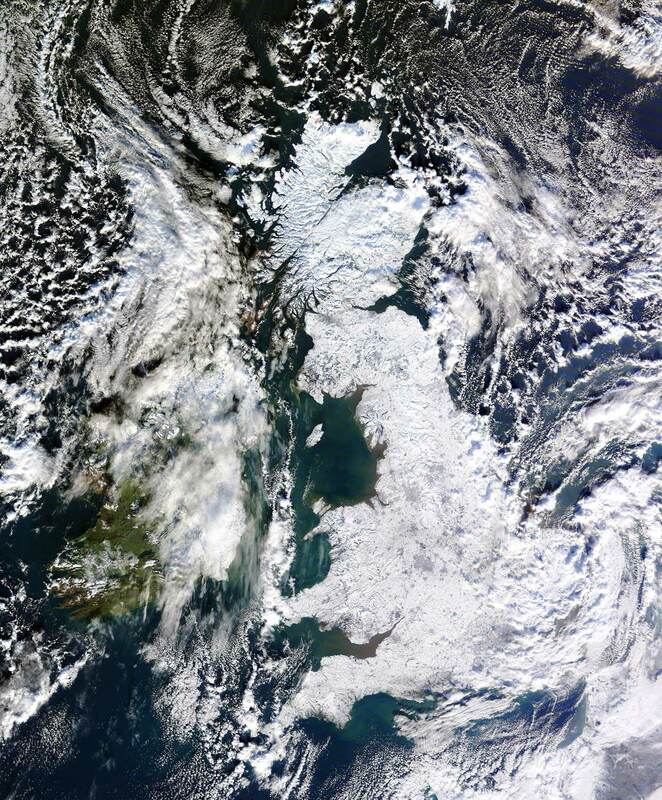 I’m sure most of the Brits out there have seen this amazing NASA image of Britain covered in snow. I love satellite images and use them a lot in my research – they really help me get a grasp of the big picture. So, northern Europe and North America were colder than usual. 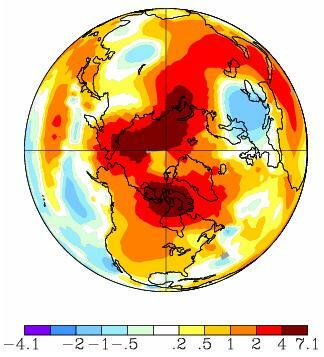 But southern Europe, Greenland, the Arctic and north Africa were all warmer than usual. The situation for January will probably be quite similar. So, looking at the bigger picture, the recent cold conditions in the UK don’t really tell us much about climate change – we need to look on big scales in both time and area.